Body surfer, world traveler, dedicated stockbroker, and beloved Papa, (Henry S.) Hank Kinsell passed away in Thousand Oaks on April 1, 2017. 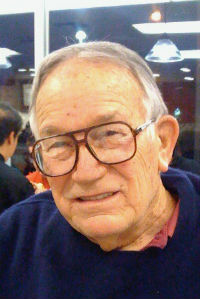 Born in San Francisco in 1927, Hank spent most of his life in Santa Barbara. Proud to be a graduate of Roosevelt Elementary and La Cumbre Junior High, he was a Don from the Santa Barbara High School Class of 1944. After serving in the U.S. Navy, he graduated from the University of Oregon and Stanford University Graduate School of Business. He and his wife Sally met at the University of Oregon where Hank was a member of the Chi Psi fraternity. Hank and Sally’s family finally settled in Montecito in 1966. Hank loved the challenges of his career as a stockbroker and retired in 1992. Active in his community, he served as the president of the Montecito YMCA and was once a member of Montecito Rotary. His favorite volunteer activities were managing the YMCA Christmas tree lot and delivering meals and serving on the board of Meals on Wheels. Sally and Hank traveled the world. Hank enjoyed soaking up the local culture in public places abroad. He also felt he could get to know a place best if he was off the beaten track. However, his favorite spot was sitting on Miramar beach while reading The Wall Street Journal. He competed in bodysurfing championships and shared his love of the ocean with his daughters and grandchildren. Hank is survived by a loving family; his wife of 66 years Sally, daughters and sons-in-law Eliza and Dave Kropp of Moorpark, Sara and Peter Hadley of Moorpark, and Annie and Steve Ellberg of Ventura, grandchildren Sara (Kropp) Jacobsen and her husband John, Garner Kropp, Ben and Annie Hadley, Grace, Charlotte, and Sally Ellberg, great grandchildren Helen and Frederick Jacobsen, brother Sey Kinsell of Santa Barbara, and many nieces and nephews.